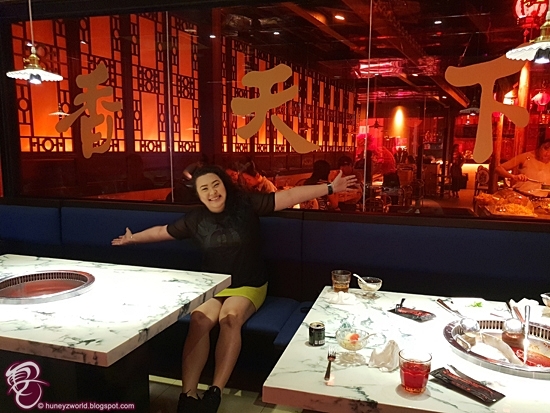 This post came a little delayed due to some family matters but that aside, for those who are fans of spicy food like me and love challenging your tastebuds with Ma La Hotpots, I have a new eating spot to recommend to you - Spice World Hot Pot (香天下). 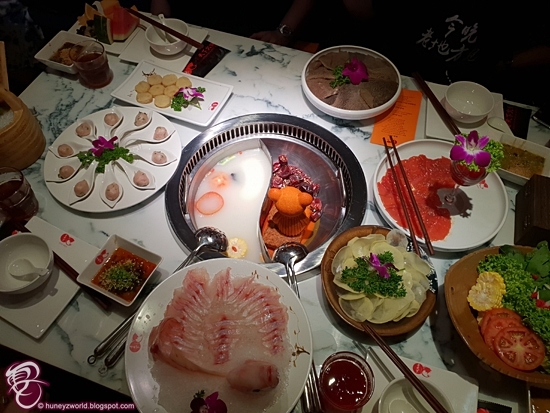 Spice World Hot Pot has opened their inaugural Singapore branch within Clarke Quay. 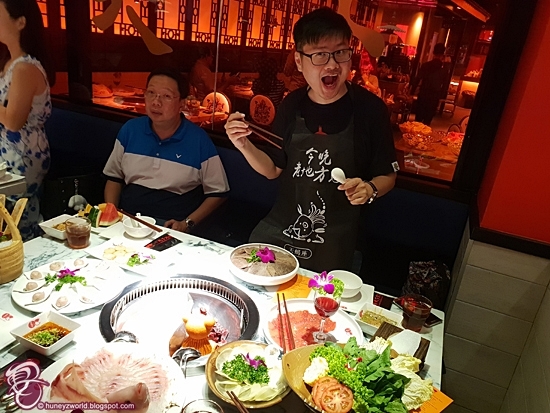 Hailing from China, founded in 2003 and is one of China's top ten global brands, that even former U.K Prime Minister David Cameron had to make a special visit to this hotpot restaurant when he was in China. 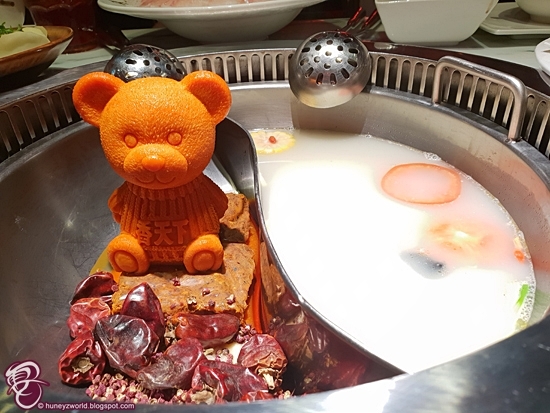 What drew him and many of their fans (me included) to this restaurant are not only because no artificial flavouring, MSG or flavour enhancers are used in their dishes; the meat are all served fresh but also the iconic Teddy Bear or Hello Kitty "figurine" that's sweeping through social media. 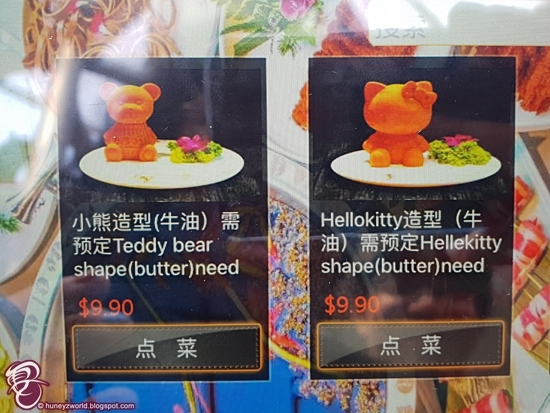 So, what's this mysterious teddy or kitty? 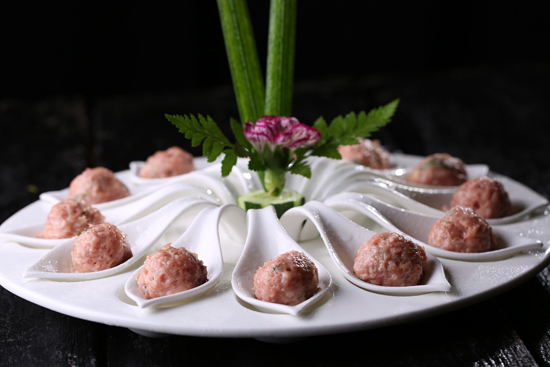 They are actually shaped out of mala soup and beef oil, which will melt with the broth to give you the perfect mala soup base. They are only available at an additional SGD$9.90 and remember to make a reservation for them first hand as they are limited to 8 per day. Dining at Spice World is as though a trip to China, outside you have the modern clubbing scene at Clarke Quay, but as you walk closer to the restaurant, the fragrance of Sichuan peppercorns and chilies will tickle your noses; and then you are greeted to the restaurant's takes on an old world meets new modern design. 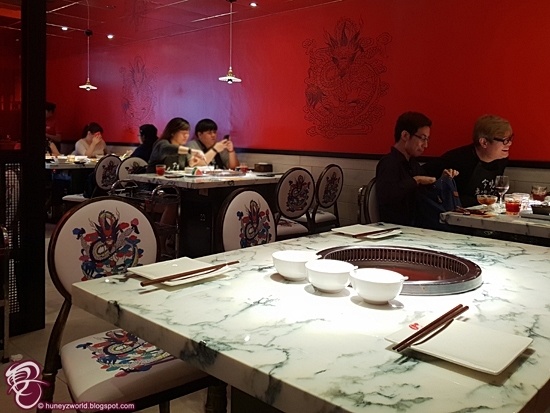 With the first half of the restaurant set as modern and chic, with a warm red setting, mirrors on the ceiling, modern seating with iconic Chinese graphics greet you as you settle down on the seats. 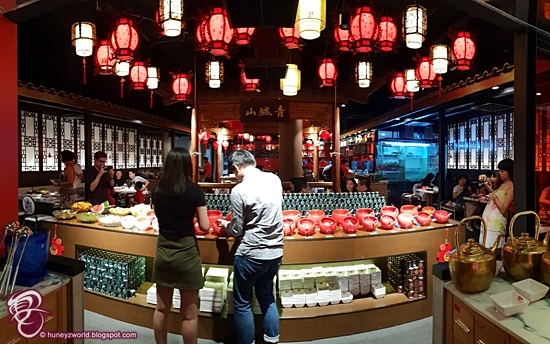 But the magic is at the second part of the restaurant (where you can go get your mix of sauces), traditional Chinese wood is used for the architecture and in the middle, you can find and dine within a pavilion. It is inspired by the view in Mount Qing Cheng, a UNESCO world heritage site in Sichuan province known for its magnificent landscape and scenery. 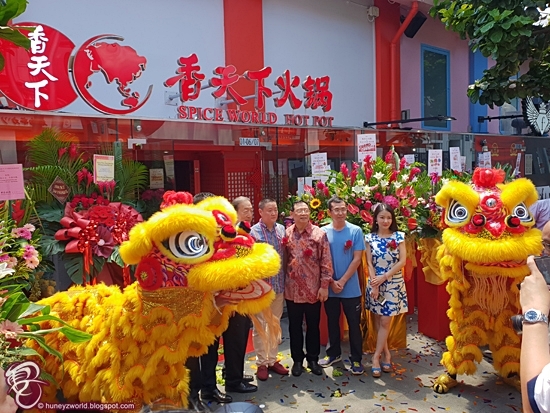 It's literally a piece of art by itself, designed by world-renonwned cutting-edge architectural space designer Shen Lei, Spice World was conceptualized, built in China and later re-assembled in Singapore. And speaking of sauces, there's a plethora of them, you can create your very own concoction or ask the waiters/waitresses to help you create a sauce that's to your liking. My favourite is just a simple scoops of sesame paste, sesame oil, soya sauce and vinegar. Be sure to get a can of the Zanthoxylum Oil (Sichuan Pepper Oil), which will numb your tongue as you dip it with your meats. It's a magical experience when having it with the mala soup base or chilli sauces. Give it a try, I was told this oil is good for lungs and also good for a good night's sleep. Ok, back to the hotpot. 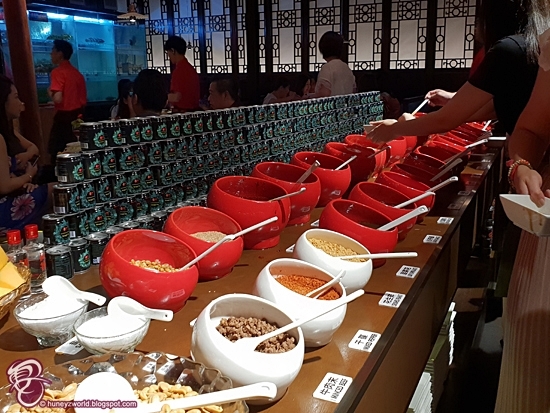 There are 7 different soup bases to choose from - mala, which comes in 3 varying degrees of spiciness (mild, medium and hot), pork belly and chicken, three-delicacy (pork, chicken and duck), wild mushroom, tomato, tom-yam, and curry. 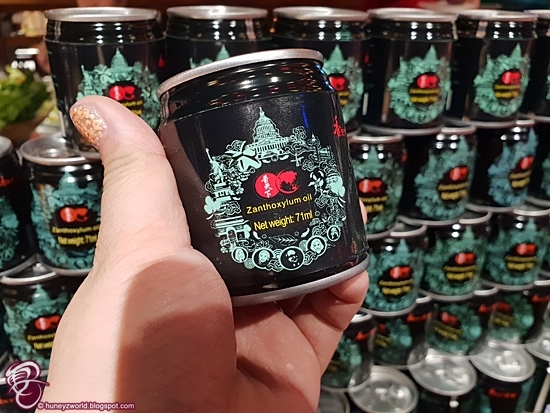 A single serving broth is priced at SGD$6 or for those going in big groups, go for the Yin Yang Broth (2 different soup base) at SGD$22.90 and Benz Triple Flavour Broth (3 different soup base) at SGD$25.90. 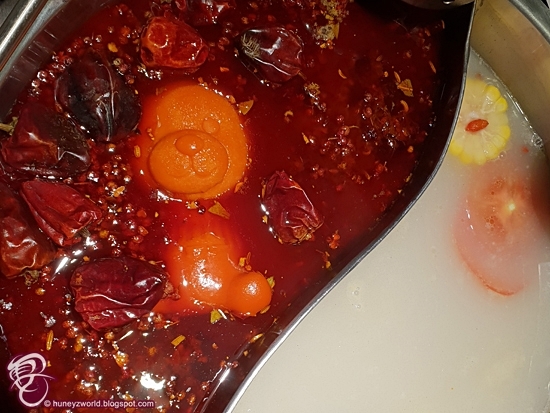 The soup bases are first brewed in Sichuan China using the most carefully sourced deep forest peppercorns from Hongya farmlands, chilies from the mountainous origins of Guizhou and Sichuan, before being air-flown to Singapore where it goes through a secondary preparation. All soup bases are brewed for at least 4-6hours, so every sip you take is soaked with essences from the ingredients. The dishes are all Insta-worthy, plated beautifully for all your social media postings. 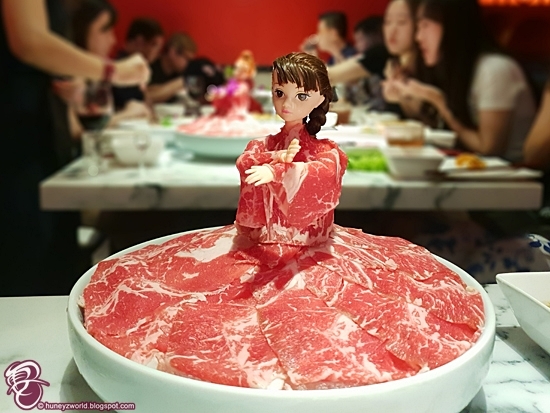 Take the Australian M8 Wagyu Beef, for example, the meat is all nicely draped over a doll to form a dress that even Lady Gaga might say yes too? 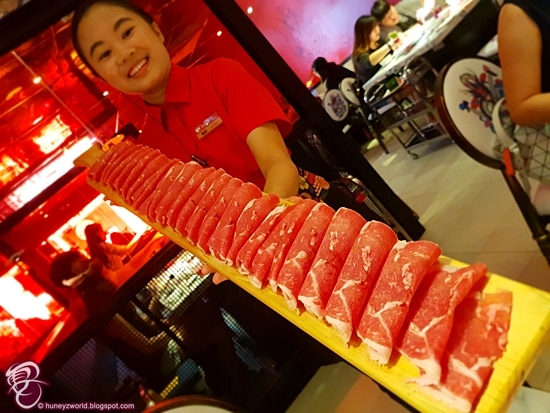 There is also the Australian Mutton Slices that are served on a meter long plank, as well as the Prime Minister's Pork Balls (former U.K Prime Minister David Cameron's favourite dish) made from pork belly and parsley. For seafood lovers, don't miss out on the Shrimp Pastes served on bamboo sticks, made from 100% shrimp meat and tobiko, it's super bouncy and chewy, a good pairing to go with all the meat dishes. At Spice World, be ensured that all these dishes are freshly sourced and prepared. Meats - beef, pork and lamb, and seafood are all hand-sliced as opposed to those frozen and machine cut ones. All in all, my experience dining in Spice World has been a delightful one. 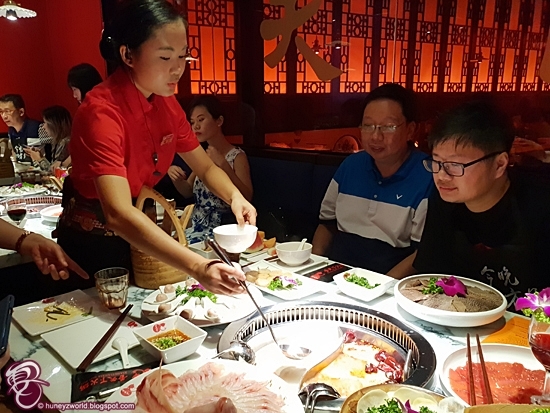 The ambiance is very relaxing and pleasant, the staff is very friendly and every table gets a dedicated waiter/waitress to help make your dining experience an enjoyable one. Not only did they provide aprons in case we dirty our clothes, the waitress for my table also offered to help me make the sauce, help serve us so we don't have to stretch too far and also at the end of the meal, offered to help us get fruits for us. Thank you Spice World for the great experience and if you are drooling for some mouth-watering Hotpots, for the month of June, Spice World Hotpot is here to satisfy those late night supper cravings of yours. 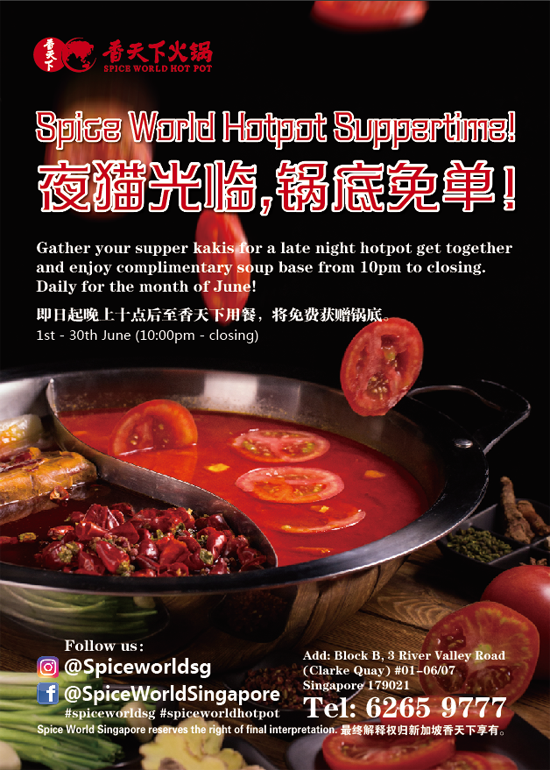 From 1st to the 30th of June 2018, all soup broths will be complimentary from 10pm till closing. You can choose up to 2 different Yin-Yang combinations from the 7 broths available (Spicy Mala, 3 Delicacy, Pork Belly and Chicken, Wild Mushroom, Tomato, Tom-yam, and Curry). Additionally, you can also receive a voucher for use on your next visit.